By the end of the 1950’s, tank development in both the UK and USA was becoming more streamlined with fewer outrageous ideas for atomic or super heavy monster tanks. The ‘Main Battle Tank’ concept had taken hold by 1957, inheriting the role of the medium tank. Heavy tanks were still seen, certainly in the US, as being the ones to take out the heaviest enemy armor but soon too that role was subsumed into the duties of the MBT. The Soviets weren’t much for caring about such things and still had their own heavy tanks and well protected medium tanks which were causing consternation in the West. The Western powers lacked parity in both numbers and quality with the Soviets and both the US and UK had identified the need for a new medium tank for the 1960-1970 era. The United Kingdom, for instance, was still using the Centurion tank (a WW2 era design) and the USA, which was using the M48A2, was still developing the tank which would eventually become the M60. In the short term, the UK would up-armor and up-gun their Centurions to meet the perceived threat of the Soviet T-55 tank until their own new tank, the FV4201, could enter production. The FV4201 is better known as ‘The Chieftain’ and, despite being near the end of its development, many features still had not been settled on. The US equivalent program, the T95, was typical of US programs, an enormous entanglement of overlapping developments and was busily trying to encompass all of them. The project was still fairly new, however, with prototype hulls only authorised to be constructed in 1955. Thus, from 1957 to 1959, there were basically two tanks under development, the British Chieftain, which was nearing completion, and the American T95 which had only just started. The United Kingdom, Canada, and the United States were already liaising closely in the new Cold War era on a variety of developments and tank design was not omitted from this. Work between the United States, the UK, and Canada, known as the ‘ABC’ countries (America, Britain, & Canada), had even achieved some degree of interchangeability and standardization for tank programs by 1957. Programs which had been fulfilled were standardization of the British 105mm gun, the British 120mm gun, an American version of the British 120mm gun, the American 105mm T254 and 120mm T123E6 guns, and three projects related to the FV4201 and T95. It was noted though that “in order to permit the FV 4201 turret to be mounted on the T95 hull, the U.K. consider modifying their turret ring with the T95 hull mounting surfaces”. It was agreed that “if the U.K. ring can be made interchangeable with the U.S. ring in respect to mounting surfaces on the hull, it will be possible to mount the complete turret providing major modifications are made to the turret basket”. The major modifications being that the British turret basket was too big for the T95, a smaller turret basket would be needed which would reduce significantly the amount of ammunition which could be carried. Even so, the expectation was that the T95 with a reworked 4201 turret and basket would carry at least 50 rounds of main gun ammunition. The panel reviewing the situation were adamant that all medium tanks must have ready rounds “stowed in the turret fighting compartment… in a favorable position for rapid loading of the main armament”. That was not the end of the problems with the idea though. The turret bustle of the 4201 masked the air louvers on the T95 hull which “would undoubtedly affect the engine cooling”. One curious note records that one issue was that the driver’s periscope on the T95 hull interfered with the 4201’s gun mantlet. Exactly what this means is not clear as the FV4201 turret design was mantletless. The British FV4201 was scheduled to enter production in 1962 with an expectation of prototypes available for trials by 1959. This new British tank meant to replace the Centurion was to mount a 120mm main gun using bagged charges. A lightened version this gun was also in development in the USA to weigh just 4156 lbs. (1885 kg). Since the initial specifications for the FV4201 were provided in the 1957 conference the design had changed slightly, improving the hull armor slope and the depression of the main gun (in a mantletless type turret) was improved from -7.5 degrees to -10 degrees. The FV4201 turret would not be able to mount the T123E6 120mm American gun though as the weight would put the turret out of balance but it could mount the US 90mm instead. To do so would involve the use of an adaptor sleeve and the mounting surfaces of the gun but this was seen as having value for the tank in the short term. On the other hand, the British 120mm bagged charge gun could be mounted in the T95E1 turret with only minor modifications made to the gun mount albeit at a weight increase of 1600lbs. (725.7kg). Of note here is that the T95E1 turret was the fifth turret in the American T95 program. When the T95 chassis was chosen to be common to both medium and heavy tank programs, five more chassis (for a total of 9) were ordered along with this turret. Four of those chassis went to the heavy gun tank program but as that program had no turrets ready three of the chassis were expediently fitted temporarily with existing turrets just for automotive trials. The remaining chassis got this new fifth turret and therefore was designated T95E1 to differentiate it from the others. The mention in the conference specifically for T95E1 can only, therefore, relate to this vehicle. The 90mm T208 gun mentioned could fire the T320E60 APFSDS-T rounds at 5,200fps (1,585 mps) and defeat 5″ (127mm) of armor angled at 60 deg. at a range of 2000 yards (1828.8m). The other gun mentioned in the Tripartite Meeting on Tank Armament is the American 105mm T254 which is a lightened version of the British 105mm gun. The T254 was known to fit in the T95 turret, although “it is not planned now to install this gun in this type of turret since the installation is not ideal from the standpoint either of turret balance or turret configuration” but would be mounted on a T95 for test purposes (which would be known as T95E5). The advantage of the T254 gun was that if that gun became the standard US medium tank gun then it would be able to utilise the same ammunition as the up-gunned (105mm) British Centurion (assuming a suitable primer for the shell was selected). The Canadian contingent considered it “highly desirable that the gun and ammunition [for medium tanks] be standardized. To this end, the 90mm smooth bore can be placed in the FV4201 and the T95 turret modified to accommodate the 105mm X15 and possibly the UK 120mm bagged charge gun”. The Canadians were anxious to see comparative firing trials between these two guns and to make an objective decision on their choice for a new medium gun tank although both were expected to exceed the requirement to defeat 120 mm of homogeneous armor plate at 60 deg. at 2000 yards which had been agreed as the standard at the Third Tripartite Conference. Like the FV4201, the T95 was to use cast sections of armor for the nose with the sides and floor made from armor plate welded to the cast sections. This was a departure for the Americans who had already been using an all cast hull for the M48. The entire T95 turret was cast armor but the FV4201 turret was only cast in the front with the other sections made from plate armor welded on. Overall, the T95 was expected to be a significant improvement over the M48A2’s which were already in service as “for example, the latter [M48A2] can be defeated from the direct front by the US 3000fps [914.4mps], 90-mm AP projectile on the upper hull front from 125 yards [114.3m] and on the turret front from within 1,550-yards [1,417.3m] range. The new medium gun tank, on the other hand, cannot be defeated from the front by this projectile”. It was further theorized that the frontal armor was sufficient to defeat a theoretical Soviet 100mm AP shell traveling at 3,500 feet per second (1066.8mps) at 1,500 yards (1,371.6m) across a 60-degree arc. The armor was considered deficient, however, in terms of protection for the engine deck, sides, and rear, as well as having defective floor armor insufficient to protect from high-pressure mines. A final note on the protection for the T95 was the consideration of siliceous cored armor inside the frontal hull and turret castings although this still had not been done by this time and did not form part of the consideration for the interchangeability of the guns or turrets. The Tripartite meetings of the ABC countries featured many Canadian needs. They did not class themselves as a tank producer nation, just a user, but they also had specific requirements they wanted from the tanks they were being expected to purchase. Being able to purchase either UK or US tanks effectively meant that the Canadians could be selective with what they wanted and expect that anyone who wanted to sell tanks to them would meet their demands. For the new medium gun tank, they had agreed back in 1955 to the weight limit for this vehicle being set at 50 short (US) tons (45.36 tonnes). Both the T95 and FV4201 met this requirement, with the T95 being 20,000lbs (9,072 kg) under the weight limit. The Canadians wanted standardization of guns, ammunition and gun mountings. They also demanded that any gun chosen had to meet the 120mm/60deg./2000 yard standard and be used in comparative firing trials. There is a small irony here that neither the FV4201 nor the T95 actually had that level of protection themselves. Further, the Canadians noted that, in comparing the designs of these tanks, the US had placed their emphasis on reducing the size of the vehicle and that while the T95 had less protection against kinetic energy ammunition than the FV4201, it did have a higher level of protection against chemical energy weapons (HEAT rounds). In estimating the performance of the guns on offer, they determined that the UK 120mm bagged charge gun appeared to be more effective than the US 90mm smoothbore. In terms of sighting arrangements, the Canadians also preferred the British system for gun control as it was simpler, making use of a ranging machine gun compared to the US which “was still developing complex arrangements in preference to the ranging rifle system”. In a nutshell, the Canadians wanted the best of both worlds, they wanted the hitting power of the British gun combined with the lighter, lower, more mobile US T95 to which they recorded that “the UK gun in the US tank would seem to be the logical answer. It may be technically possible to mount the 120mm bagged charge gun on the T95. With such a combination we should, for once, achieve a qualitative superiority over the Russians”. The T95 with British gun combination favored by the Canadians was eventually effectively created by the US T95E6 mounting the 120mm T123E6 gun although the British 120mm X23E2 gun or lightened US version of it were still possible for mounting. In the meantime, while those experiments and considerations were going on, the UK had already submitted drawings to the Americans for a cost analysis for the re-engineering needed to fit the T208 and T208E9 guns in the FV4201. As it turned out, this project too came to nothing. R.P. 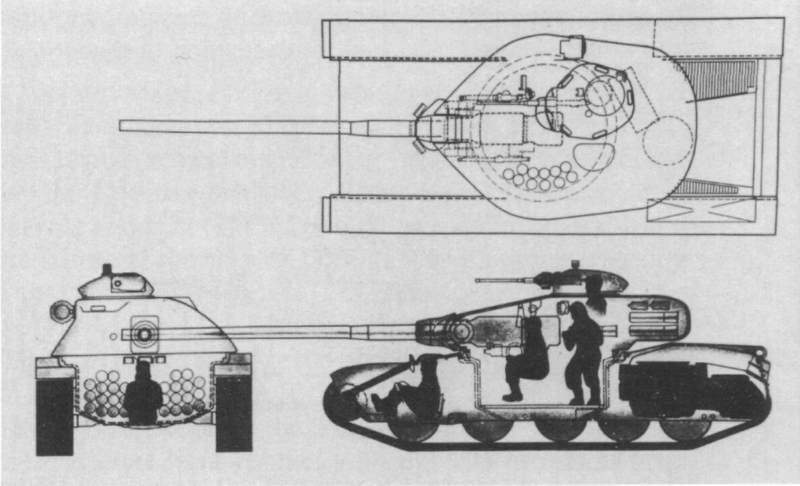 Hunnicutt (Abrams) records that the British 120mm gun was eventually mounted in a T96 turret in Study F of the T96 program (this being the heavy tank program) although the bagged charge was not popular with the US testers leading to the proposal to adopt a new breech and combustible case ammunition for it instead. The Americans were suitably impressed with the British 105 and 120mm guns though. So much so they made their own versions of them and “these two weapons and the original British guns were superior for tank use because of their lethality combined with lightweight, relatively short tubes, and short rounds requiring less loading space”. The only drawback of using the 120mm gun in the T95 turret was the necessity for a single loader to handle the two-piece ammunition” although a loader assist mechanism was considered to make this concern moot. Either way, the Americans elected to move on to a single piece round and modify the gun accordingly. That modified gun was then fitted into a T95 turret in Study G (back to the medium tank program) producing a balanced gun capable of being stabilized for firing on the move. After the T95 program had been abandoned, the turret interchangeability concept didn’t go completely away. An initial assessment was even carried out on the XM60 as to whether it could take the British turret, the conclusion was that it was possible although it would certainly have been an odd-looking tank. The end outcome of all of the interchangeability studies is hard to gauge. The British stuck with their bagged charge gun, the American eventually chose their own gun for their own use and the Canadians were left without the tank they wanted. The option the Canadians had chosen suited their needs better than either the T95 or FV4201 could on their own: plenty of hitting power with a much more mobile vehicle. The T95 program was eventually terminated and the Canadians didn’t take Chieftains, preferring the mobility and firepower of the up-gunned Centurion instead. The interchangeability of the guns was in itself a good idea, especially for replacement in wartime and the British turret and guns were well regarded. The interchangeability of the turrets was not easily rectified though, the Chieftain was nearly at the end of development and the British were unlikely to completely redesign the turret basket when there was no perceived market. The Canadians, after all, found the T95 turret acceptable in its own right, they just wanted the better gun. So, at the end of all this work, the overall outcome was that the interchange of T95 and FV4201 was indeed possible. The FV4201 needed some work on the ring and basket, to take the T95 turret and the idea of mounting the T95 turret on the Chieftain was an altogether bigger task which no one was interested in trying. The report terminated discussion of the matter saying “it appears unlikely that the US T95 turret can be mounted on the UK FV4201 chassis without a major redesign of components which cannot be contemplated at this time”. As a result of the problems involved in modifying turret rings to match each other and overlapping demands for which gun was preferable, the whole affair was terminated with no prototypes completed. The discussion does provide a real insight into just how hard it can be to design a tank to suit more than one role and customer and the idea of swapping turrets from the T95 and Chieftain tanks or even the XM60 as well as a variety of gun options remains popular if not in military circles then at least in those of modellers. Total weight, battle ready >32 US short tons est. Speed (road) 35 km/h est. Total weight, battle ready 32 US short tons est. T95 hull with XM60 Turret and standard 90mm Gun. The hull of T95 Pilot No. 2 with 90mm Gun T208. FV4201 hull with T96 Study F turret and British 120mm bagged-charge gun, without fume extractor. T95 hull with an impression of an Americanised FV4201 Turret with M48/M60 style commanders cupola and 120mm gun with fume extractor. T95 Hull with the standard FV4201 Chieftain turret and 120mm gun. Thanks for this interesting article. It’s a shame that the tank was never built. Such a beauty. Looking forward for the T95 article. Can you guys update the T-72 mahima tank?